The very first pixel artist is unknown but was a Xerox Corporation employee. THIS image shows the very first true pixel art. After Apple bought the OS to develop the first MacOS, it was Susan Kare who led the creative team that developed the icons we all know today and is credited as the first pixel artist. 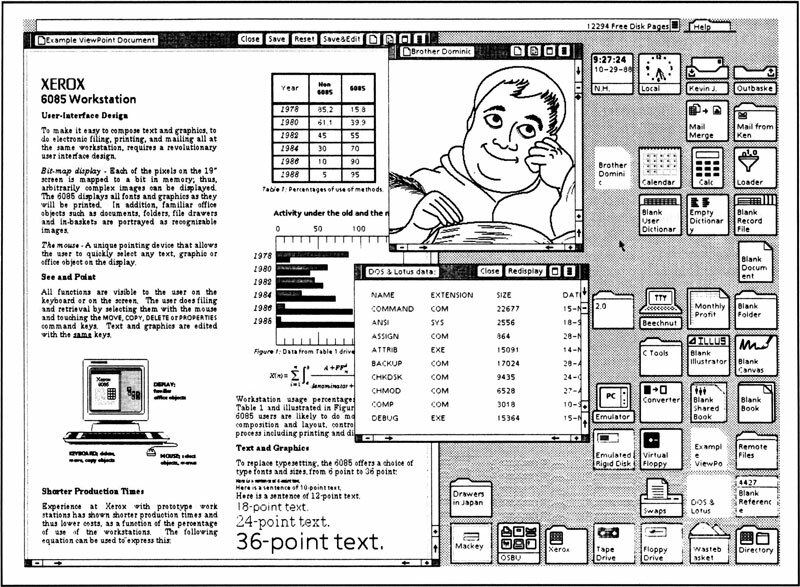 Ehm, I think there were a lot of games made before the first graphical user interface? Game nr1 Spacewar! has some cool artwork, but I don't know if it is based on a bitmap or on vectors.. But it is from 1961!!! The Xerox image was the best I could find when posting this article and was meant to show the pixelling style used byXerox as opposed to the 'first' ever pixelart. No video game was ever made or produced prior to the original usel interface which is where obviously the first pixels would have been created. The image showing the *first* true pixel art is named xerox-star-interface.jpg. Wikipedia tells us Xerox Star was launched in 1981: http://en.wikipedia.org/wiki/Xerox_Star. The image shows specs for the xeriox 6085 which was released in 1985... So i really doubt this is reliable! What am I supposed to see on the xerox star interface? The overview article was cool.